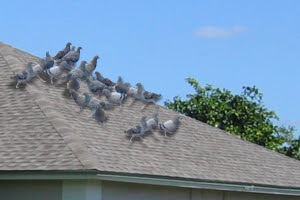 One summer day in the late 1950’s, a dear old lady on Railroad Street in Derby, Maine decided the roof pigeons had to go. Her afternoon naps were interrupted listening to constant cooing while an army of tiny footsteps scratched around on the roof. Throughout the entire day antics included coordinated flights of a couple dozen pigeons flap-flap-flapping coming and going. Droppings were another nuisance. It was time for action. Stepping outside and back a few yards, she let loose with a pistol and fired off 4 or 5 shots trying to at least scare if not kill a few of the rascals. Ayuh, it worked. They were gone in a flash as a few feathers went flying, and after a wide sweep around the block the entire flock returned back to her roof. Each was unscathed and fearless. Unfortunately for the widow, she missed the pigeons completely but managed to aerate the roof with 5 holes that leaked like the dickens come next rain.